An Initial Exploration of Printz Award Winners from Outside the U.S.
Editors’ Note: This paper is the last in JRLYA’s series of brief papers presented at YALSA’s 2010 Young Adult Literature Symposium: Diversity, Literature, and Teens: Beyond Good Intentions, November 5—7, 2010. The Michael L. Printz Award has existed for just more than a decade, still in its infancy compared to the Caldecott and Newbery awards. 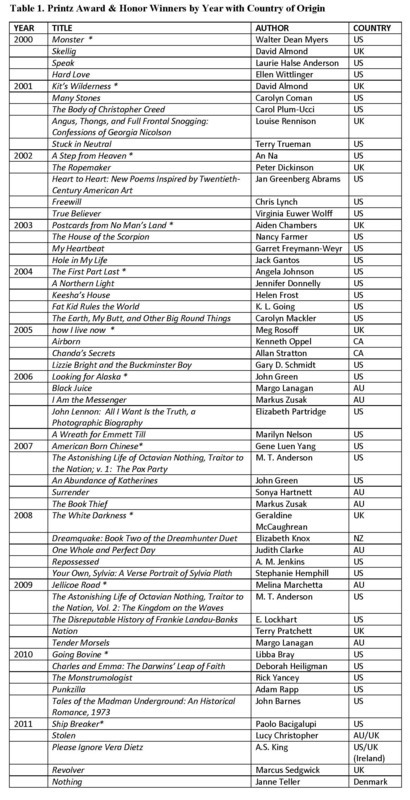 As I examine the lists of winners and honors titles since 2000, I am struck by the international range of the selections.1 While the majority of titles are by authors based in the United States, the percentage of titles from other English-speaking countries is significant. Drawn to the international aspect of the Printz Award, I recently began work on my doctoral dissertation at Charles Sturt University of Australia, focusing on the amazing number of books by Australian authors that had been recipients of the award or an honor selection. I intend to examine the factors that set Australia’s best young adult fiction apart from the hundreds of other books available to American teen readers, as well as explore differences between the Australian and American publishing industry, which may have contributed to the degree of attention Australian authors have received. Table 1 depicts the Printz Award winners and honors books by year and includes the authors and their countries of origin. In only two years, 2004 and 2010, were all Printz—winning titles written by American authors. In 2005, only one of the four winning or honors titles was by an American. In both 2008 and 2009, the majority of winning or honors titles were by non-American authors. There have been fifty-seven Printz Award-honored titles since the award’s inception in 2000. Table 2 illustrates a breakdown of all the Printz Award titles by country of origin and percentage of the total. These numbers may not seem significant until one realizes the comparatively small percentage of foreign young adult books sold in the American market. During the six weeks I spent in Australia in 2010 doing research for my dissertation, I had the opportunity to visit a number of bookshops and to speak with several authors and publishers. In the bookshops, especially independent ones, I was amazed by the number of completely unfamiliar titles and authors. I have been a school librarian, primarily on the secondary level, for more than twenty-five years; during that time I have been a reviewer for two publications and I am an avid reader of young adult fiction. I have also taught a university course on adolescent literature as an adjunct lecturer. With typical American arrogance, I always thought I knew my stuff–until I saw Australia’s young adult literature. Of course, there were the usual American and British offerings, but also packing the shelves of those bookshops were some names of familiar Australian authors, and I’d never heard of many of the titles. Beside them were books by authors of whom I had been totally unaware. Australian bookshop owners and an avid Australian YA blogger gave me a tour of the teen section of Gleebooks that left me reeling, as if I were in–well, another country! The realization was not gradual; it was sudden and momentous and weighty: there existed, in this fellow English-speaking country, a teen book culture that certainly overlapped America’s in certain areas, but in others was totally and incredibly alien. Publishers, bookstore owners, and authors offered various explanations and insights into this new world. They agreed that as long distance transportation becomes quicker and more regular and the media raise awareness of titles from a variety of sources, American titles have been playing an increasing part in the reading habits of teens around the world. American titles are infiltrating foreign markets to a much greater degree than foreign titles are infiltrating the U.S. market for several reasons. First, there is the sheer size of the United States–American publishers’ print runs can be in the tens of thousands because the potential market is so huge. England’s market, historically more familiar and accessible to American readers, is smaller; Australia’s and New Zealand’s is smaller still. Australian publishers simply do not print tens of thousands of copies of young adult titles. American publishers also tend to be reluctant to pick up titles from abroad. We may pride ourselves on our multiculturalism, but it is a multiculturalism filtered through an American perspective. Publishers still feel that authentic foreign dialect and vocabulary may deter teenage readers and Australian authors are equally reluctant to rewrite their books for an American audience, insisting that even American kids should be savvy enough to figure out through context that a “servo” is a service station and an “esky” is a picnic cooler. The result is that the United States sees only a fraction of international young adult fiction written in English. So it is all the more significant that so many Printz Award winners and honors titles have been by authors from a country other than the United States, and that nearly half of the top award winners have been by non-American authors. The Australian publishing industry includes a practice that may set its young adult books apart from their international counterparts. The same book may be published with different covers and marketed to different audiences, such as to adults and to children, simultaneously. This was the case with Margo Lanagan’s Tender Morsels. Although promoted in the United States to young adults, The Book Thief by Markus Zusak was published in Australia as an adult title. In addition, Australian publishers do not group all “young adult” books together as a genre; rather, the genre is divided along age lines and books targeted towards thirteen-year-olds are differentiated from books for eighteen-year-olds. The books for older ages tend to feature a character type not often seen in American books: nineteen- and twenty-year-olds, out of high school, sometimes at uni (as in “university”), sometimes working (or, in some cases, not working). Thus, we see an older protagonist, out of school and on his own, in Markus Zusak’s I Am the Messenger; Liga, the heartbreaking main character in Margo Lanagan’s Tender Morsels, is a twenty-something with two young daughters; and there is a wide range of ages featured in Lanagan’s short story collection Black Juice. While coming of age and growing independence is a common thread running through many Printz Award titles, few carry those themes quite so far. The Printz Award titles also represent a variety of genres, ranging from contemporary fiction to biography. While it is difficult to classify some of these titles into single genres, Table 3 illustrates the approximate breakdown of titles by genre. Curiously but appropriately, this breakdown probably represents a collection analysis of the holdings of the average high school library media center, with the possible exception of equal numbers of poetry and short story collections. Contemporary fiction has always been the mainstay of young adult literature, a fact that is clear from an analysis of the Printz Award titles. The research for my dissertation is still in its early stages, and certainly more trends like those described here will become clear as it continues. One major piece that remains missing involves interviews with American publishers of teen fiction, as my perspective is currently skewed towards their Australian colleagues. However, it is clear even now that quality literature for adolescent readers is coming out of English-speaking countries around the globe, and that American librarians serving teens are recognizing and celebrating the unique contributions of international authors to an evolving genre. American Library Association, “The Michael L. Printz Award,” www.ala.org/yalsa/printz (accessed Nov. 1, 2010). This entry was posted in Volume 1 Number 2: February 2011 and tagged Michael L. Printz Award, nationality, young adult literature. Bookmark the permalink.